I have blue eyes and love adding coloured eyeliner to give my eyes that extra pop. I usually wear blues and purples on my eyes so when I came across this Cobalt Blue colour I couldn’t pass it up. 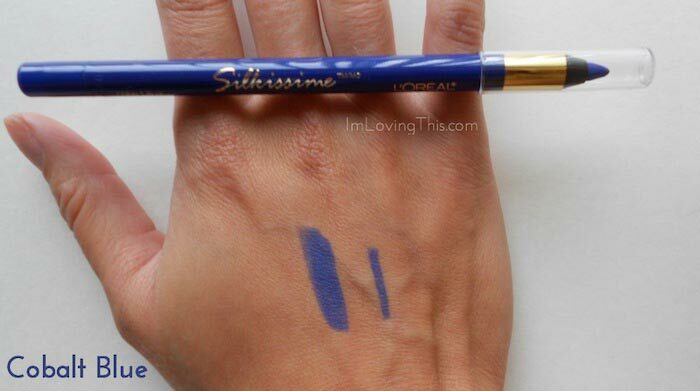 I’ve been using the L’Oréal Infallible Silkissime Eyeliner in Cobalt Blue for over a year now, and have also picked up True Teal in the same line. I decided to finally write a review because I’ve been wearing the liner almost every day for the past month. I didn’t reach for it much during the winter and am back to using it regularly. I love these liners, they glide on silky smooth and remind me of the Urban Decay 24/7 Glide-On Pencils. The Urban Decay ones do last longer, as in I seem to still have them on my waterline the next day. But the L’Oréal Infallible Silkissime Eyeliner lasts all day for and is a fraction of the price. The liners are very pigmented and you don’t need to press hard to get good colour payoff. I have sensitive eyes and they are very gentle on my eyes. The pencils seem to last awhile too cause I’m still working on my first one and like I’ve said have had it for over a year now. These liners come in 10 shades including your basic black, browns etc. I only own the Cobalt Blue and True Teal as I don’t use pencil liners too often besides in my waterline. I already own two shades of purple from Urban Decay so don’t see the need in picking up L’Oréal’s Pure Purple. The two colours I own are absolutely stunning! If you are in the market for a new pencil liner then I suggest trying these ones out. Summer is near and they have some beautiful bright colours to give your eyes that extra pop of colour. The only downside to these liners are that they aren’t self sharpening so you have to sharpen them. I read some reviews that people had problems sharpening them but I’ve never had any issues and I don’t consider myself an expert pencil sharpener. If I was to pick up another colour from the L’Oréal Infallible Silkissime Eyeliner liner it would be the highlighter shade. I bet it would be beautiful in the water line, all over the eye or in the inner corners. Have you tried the L’Oréal Infallible Silkissime Eyeliners? Also, what is your favourite colour in the line?